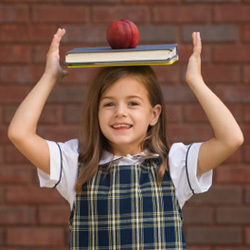 Back To School: What Is YOUR Princess Going To Wear In Her Hair On Her First Day Back?! The first day of school is nearing. It’s a fresh start. Brand new hair accessories, school supplies, pencils crisply sharpened and the folders just waiting to be filled with homework sheets and assignments. I can smell the plastic of the new binders and the rich leather of new shoes; and I smile. There is the care free feeling of a young child just waiting to drink in the knowledge that they’ll soon learn. The big question is of course: What is your little one going to wear in her hair on her first day of school? All the girls will come in looking all fresh and neat with a renewed excitement that the summer brought about. Start her year on the right foot with a variety of neat, stylish, preppy and fresh hair accessories! Below are a few cute ideas you might want to try in her hair. As we all know, braids are at the peek of fashion this season. If your daughters hair is nice and sleek, consider leaving her hair down with a middle part. Then, make a nice size braid on each side and tie them together in the back for a princess look. You can always add a nice little bow to tie it all up. This look will definitely give off some sunshine as she walks into her classroom for the very first time. Hair bows. They come in lots of different sizes and styles depending on the age. They can be worn in many different ways – you just got to be original! Form a half a pony to a pony to anything in between you never go wrong when you stick to hair bows. Hard headbands make the perfect hair accessory to keep a kids hair out of her face. Try a neon, bright and cool hard headband and let your little princess shine this year! Does your child want to wear her hair up yet it’s still a little too short to stay up? Try giving her a banana clip! A banana clip will not only keep her hair together but it will make her hair look long. In addition, banana clips are really cool and exciting – it’ll definitely give her a boost! So go ahead and get cracking on finding that perfect hair accessory for your little girl and you’ll see how excited she’ll be on that first day of school when she looks nothing less than perfect. It’s these small little details that add so much to your special day and make it as memorable as possible. When talking about weddings, let’s not forget about our flower girls! Whether your flower girls are your relatives or family friends; they really add a lot to a wedding. It’s these small little details that add so much to your special day and make it as memorable as possible. So if you’re like the many out there who choose to have your tiny friends as flower girls, you must consider the hair styles for flower girls that you want them to be wearing. Below we provided for you a few different ideas of ways you may want your flower girls hair to be done. If you are lucky enough to have a toddler be a flower girl you will soon realize that any and every little girl hair style looks cute on them since they are so small and angelic. Whether their hair is pulled up or let down in curls, the best way to go is by putting some sort of headband such as ribbon, lace, etc. In addition, you may want their headband to reflect your wedding theme and color. For example if you are doing a Hawaiian theme wedding go for something colorful and wild and if you are doing a more subtle theme such as a beach theme, a lace headband in soft blues and greens with some seashells would look really original and make them stand out. For older kids, there are a few different looks you may want to go with. The princess style is simple and beautiful, it does however have to be done with medium or long hair. You simply put their hair up in a high and secure bun on the top of their head and add a tiara. It gives a mature and classy look to any little girl and since it is pulled securely, it will last throughout the whole night. Updos are great for kids of any age. For kids with long hair, you may want to pull up all their hair and twist it into a bun with pretty updo accessories such as diamond bobby pins or updo screws, or you may want to put it half up and leave the rest down in Shirley Temple curls. For kids with short hair, it’s probably better to put it half up so that it shouldn’t fall apart too quickly. For half-up updos you can take the half a pony and make it into a flower with accessories or into a pretty little bun. In addition, you may want to twist both sides into braids or just twists and make them meet in the middle with a pretty updo screw. There are many other updo hair styles you may want to choose from but these are just a few. Simply leave their hair down and curl it in tight curls. Then, add a pretty headband from either diamonds, studs, lace, ribbons, flowers etc. The headband will pull their hair out of their face but will still allow them to wear their hair down and feel all mature and grown up. Of course, we can go on and on with lots of more ideas for our cute tiny friends, but these are just a few basic and extremely popular hair dos for weddings. We hope this helps you out and if you have any ideas that you think others will appreciate, please feel free to leave a comment!